I caught up with some friends for lunch at Handsome Her, just before New year. I’ve raved about it in a previous post so I won’t repeat myself too much here, just to again say that the food here is creative, delicious and beautiful to look at. 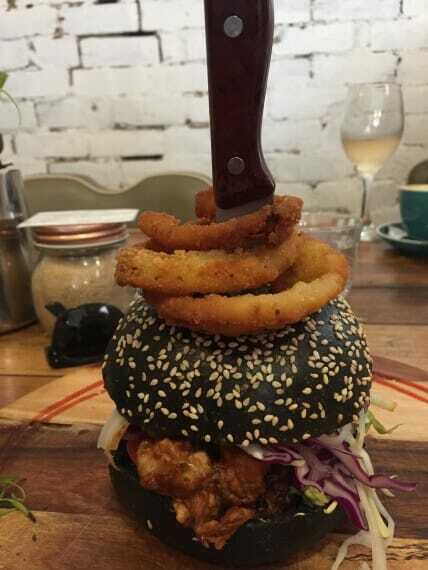 I went for the special: a pulled BBQ jackfruit burger with coleslaw, grilled pineapple and onion rings on a charcoal bun. I really tried it for the pulled jackfruit as I have never had it before (I know, what kind of vegan am I?). For those that know my ranting “pineapple is not savoury, WRONG, WRONG, WRONG” position this was always a leap. But I have to confess it worked. I even liked the pineapple. 🙂 I’m not recanting on Hawaiian pizza though. Ever. Two of my friends chose a bagel wth bacon and cheese, and the other chose a fabulous looking carrot and cauliflower salad which I had been wavering about choosing. 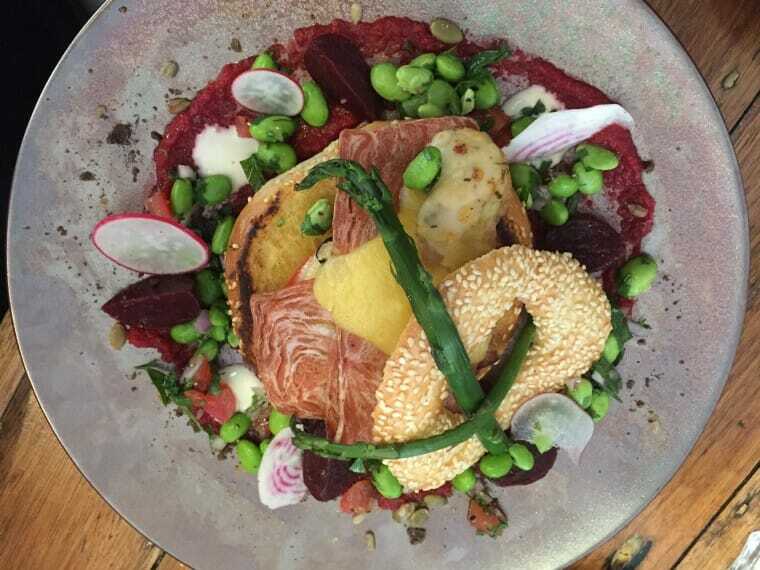 The bagel was named in honour of Frida Kahlo and described on the menu as “Cheese and bacon bagel with mushrooms, tomato, bacon and mozzarella on a toasted bagel with beetroot puree and garlic aioli, asparagus, candied striped beets, edamame salsa and five spice crumble”. It looked good except for the Vincent’s bacon which I find a little scary! 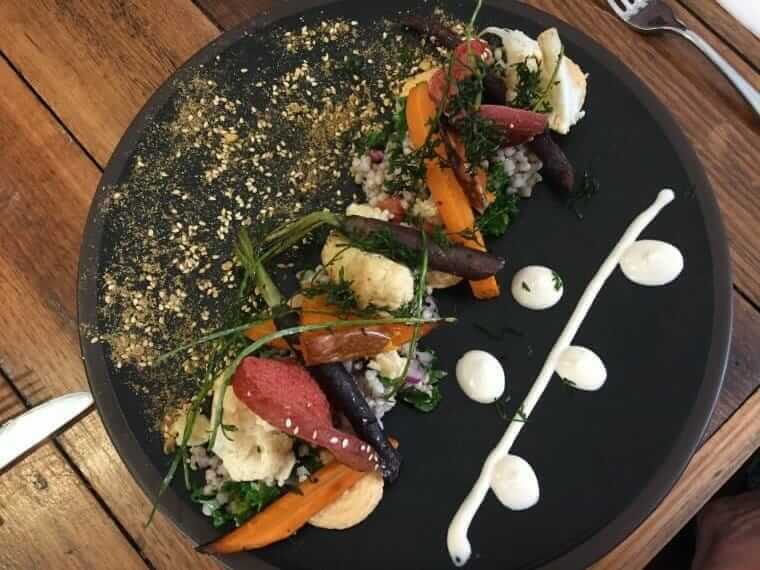 The salad was named after Moira Kelly and was roasted dutch carrots and cauliflower with buckini, kale tabouli, pumpkin hummus, sesame tahini dressing, crispy carrot leaves, almond feta, pistachio dukkah and crispy croutons. I think this took the prize for the most visually stunning plate and my friend enjoyed it. 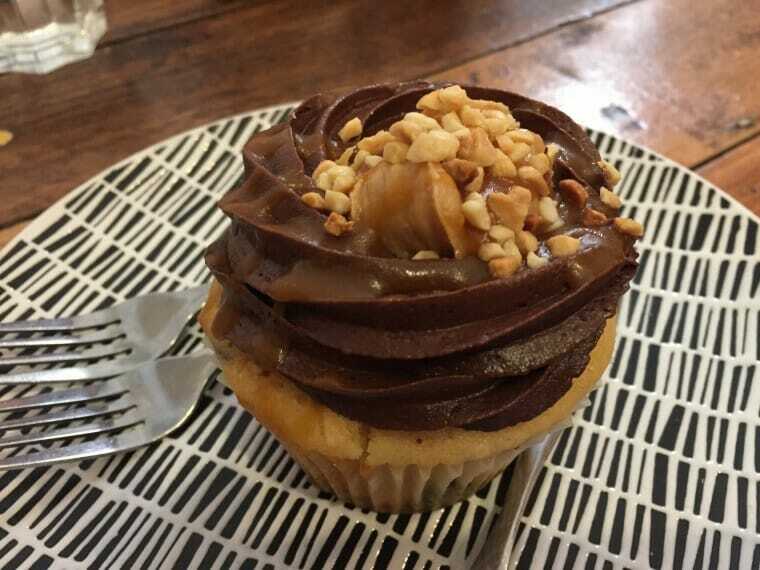 For dessert there was a snickers cupcake and an iced coffee. 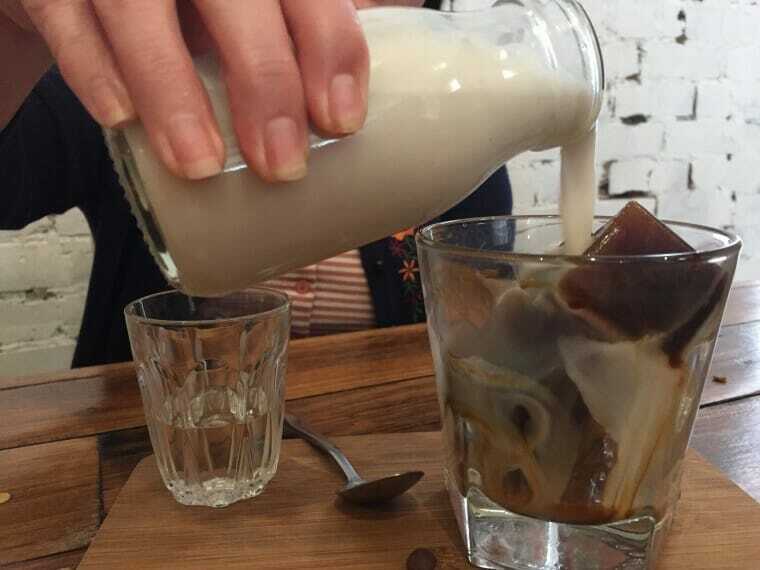 The iced coffee was a DIY affair with frozen coffee and slightly warm macadamia milk to melt the cubes. All in all, fantastic. It isn’t the cheapest place, but the food is consistently inventive, delicious and all vegan. I think it is worth the price. And the coffee is excellent too. I finally got there and had that burger which was very good – but now I am coveting that salad – looks wonderful. I went there when I was in Melbourne last year and I love it. I would love to go again and try that bacon and cheese bagel. Everything there is just so awesome.